Students in any Biology program (BA or BS) complete a strong, general series of Biology and support courses that allows pursuit of a wide variety of careers such as professional work (e.g. physician, dentist, veterinarian), governmental work, (e.g. conservation biologist, fisheries biologist), field work (e.g. oceanographer, wildlife specialist), high school teaching, industrial or clinical research, aquaculture etc. Many Biology majors continue into graduate programs in a specialized subfield. It is the goal of the department to provide solid Biology degrees that expose students to all areas of Biology while allowing each student flexibility when entering the job market. The five areas identified are: Plant Biology, Animal Biology, Cell and Molecular, Structure and Function, and Ecology and Evolution. Students are introduced to all areas of biology in a two-semester introductory sequence (BIO131 Introduction to Organisms and BIO132 - Introduction to Cells ), followed by three courses in the second year that expand on these areas in greater detail and introduce social and ethical issues to some extent. This second group of courses includes BIO208 - Environmental Problems: An Ecological Approach , BIO212 - Cell Biology , and BIO220 - Evolutionary Morphology . In their junior/senior year all students are required to take BIO402 - Genetics and either BIO415 - Biology Seminar , or NMT415 - Nuclear Medicine Seminar , depending on their specific program. Students complete their program by taking BIO electives at the 300-400 level. They generally must have one course from each of the five major areas (although there are some exceptions in specialty concentrations), plus other major electives that can be chosen from any group or from internship, directed study or research courses. To ensure that students develop more advanced lab skills, several programs limit the Cell and Molecular elective to either BIO406 - Microbiology or BIO409 - Biological Chemistry . Some specialty concentrations also specify courses in one or more of the other major areas. A complete listing of 300-400 level courses included in each group is provided below. The Aquaculture Concentration focuses on the controlled cultivation and harvest of aquatic plants and animals. Students will gain practical skills in the husbandry of aquatic organisms through applying knowledge gained from courses in Biology, Chemistry, and other disciplines. Skills learned will provide graduates a hands-on appreciation of the aquatic environment and aquaculture systems. Graduates will possess the skills needed to set-up and operate their own facility, to work at a private or public hatchery, and to pursue employment in a parallel field such as resource management, fisheries biology, marine or environmental science. Students in this concentration will take numerous courses at the Cat Cove Marine Laboratory and have the opportunity to conduct research there. The Biomedical Sciences Concentration supports students that are interested in pursuing a career in the human health fields. This concentration allows for flexibility in course selection, so students interested in a variety of health fields can be equally accommodated. The Biotechnology Concentration places this field within a broad context while focusing on both the theoretical and practical skills needed in the study of cell and molecular biology. A choice of some support courses allows the student to explore different applications such as chemistry and bioinformatics in greater depth. The Environmental Biology Concentration includes courses in both Biology and other environmentally-related fields such as geology, geography, ethics, and the social sciences. In the process of completing a degree in biology in this concentration, each student has the opportunity to select courses in other related areas which support the specific goals and interests of the student. The Marine Biology Concentration provides a broad science background supported by observations of marine organisms and their environment. The ocean and marshes of the North Shore and the Cat Cove Marine Laboratory offer a unique learning laboratory. Students in the Medical Technology Concentration who intend to become certified as Medical Laboratory Scientists (MLS) or Medical Technologists (MLT), as defined by the American Society for Clinical Pathology (ASCP), can explore various post-graduate routes to certification as outlined by ASCP (www.ascp.org). Students following the Nuclear Medicine Technology Concentration complete the on-campus component in 3 years and spend their 4th year (and preceding summer) in the Nuclear Medicine laboratories of affiliated hospitals. Registration for the summer component is through the Division of Graduate and Continuing Education. Completion of the program leads to a B.S. in Biology with a Concentration in Nuclear Medicine Technology and prepares the student for examinations leading to national certification as a Nuclear Medicine Technologist. Students in the Nuclear Medicine Technology Concentration are required to achieve and maintain a 2.75 quality point average in science and mathematics courses. Grades for courses taken at other institutions will not be used in computing this average. At least half of these required courses must be completed at Salem State University. An NMT student may not repeat any more than two of the preclinical science or mathematics courses nor any one of these courses more than once to achieve the 2.75 GPA. During the second semester of the sophomore year, the student’s performance will be evaluated by the Nuclear Medicine Technology Advisory Committee which makes recommendations concerning continuation in the program. Final admission to the clinical phase of this program is competitive and requires completion of a formal, separate admissions application in January prior to potential entry into clinical courses. The NMT Program officials use this application, the student’s university record, and the number of available spaces to determine admission into the clinical courses. The Salem State University Nuclear Medicine Program is accredited by the Committee on Allied Health Education and Accreditation in cooperation with the Joint Review Committee on Educational Programs in Nuclear Medicine Technology. All students participating in clinical aspects of the Nuclear Medicine Concentration will be expected to carry their own personal liability insurance (cost approximately $35) and should be prepared to provide their own transportation to clinical agencies. They will also be required to have Hepatitis B vaccination before entering the clinical phase. There are many opportunities for careers in the health professions, including medicine, dentistry, podiatry, optometry, and physician assistant as well as veterinary medicine. All of these advanced programs typically require general biology, general and organic chemistry, physics and one year of college mathematics in the applicant’s undergraduate preparation. The Medical College Admission Test (MCAT) includes a section on the social sciences. Courses in psychology or sociology are helpful for those interested in medical school. Students interested in the human health care professions might consider the B.S. Biology/Biomedical Sciences degree program . This satisfies the minimum admissions requirements and includes numerous content courses such as Anatomy & Physiology, Genetics, and Biochemistry helpful in preparing for standardized entrance exams. Students interested in veterinary medicine might consider the B.S. Biology/(no concentration) degree program . This satisfies the minimum admissions requirements for veterinary medicine programs and includes numerous content courses such as Comparative Vertebrate Anatomy, General Physiology and Genetics helpful in preparing for advanced study. Students interested in a career in the health professions (e.g. medical, dental, veterinary, or other professional health career) should contact the Pre-Health Advisor no later than the end of their sophomore year regarding the admissions process for graduate programs. The Pre-Health Advisor is available to all students, regardless of major. Dr. David Mercer in the Biology Department is the chair of the Pre-health Professions Advisory Committee. All students interested in applying to medical, dental, veterinary, or other professional health schools should consult with him. For more information, please visit the Biology Office - Meier Hall 404. Biology majors who are admitted to the University Honors Program should contact the Biology Department Chairperson immediately upon admission to the university. Biology Honors students follow the required Honors Curriculum described under the “The Commonwealth Honors Program ” including completion of a 3 credit Honors project, Research in Biology (BIO408 ) in the senior year. The Cat Cove Marine Laboratory managed by Salem State University and home to the Northeastern Massachusetts Aquaculture Center includes a 16 acre site, 8 acre tide pool and 5,500 square foot Wet Laboratory. 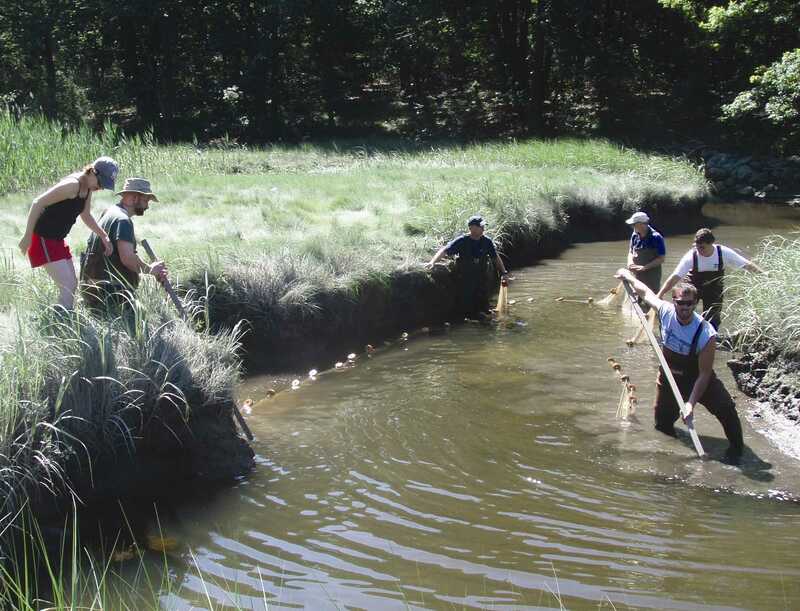 Students can explore estuarine biology in a protected and managed tidal pool. The environmentally controlled Laboratory facilitates controlled experiments and propagation of both marine and freshwater aquatic organisms. Major emphasis targets shellfish culture and mariculture of fishes with aquaculture potential in New England. Freshwater fishes are maintained and reproduced for use in primary, middle and secondary school classrooms. The Laboratory is fully equipped with tanks, computers, analytical instrumentation, and all the materials needed to run a hatchery effectively. Resources are accessible to students through classes and independent studies. The primary function of NEMAC and the Cat Cove Marine Laboratory is to provide students with a hands-on learning experience and to nurture the development of a sustainable, environmentally/socially acceptable, commercial aquaculture industry on Massachusetts’ North Shore.